Every year, millions of Americans make difficult decisions about their jobs when facing some of life’s most challenging moments and significant events. Often, circumstances require working people to take leave to care for themselves or loved ones. Unfortunately, transgender and non-binary Americans can face unique and magnified barriers that make access to leave even more challenging. 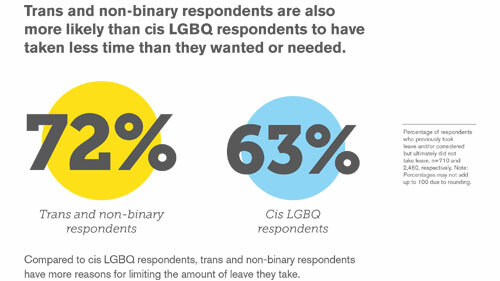 HRC Foundation’s 2018 U.S. LGBTQ Paid Leave Survey report gathered data from 1,121 transgender and non-binary respondents, detailing their ability to access leave, experiences in the workplace and concerns about managing both their jobs and their well-being.